Here I go again, buying a toy that doesn't move. 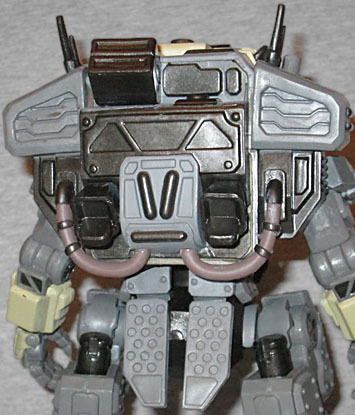 If BT-7274 was Titanfall 2's upgraded version of Atlas, then Legion is its version of Ogre, the slow chassis with impenetrable armor and impressive firepower, but sod-all in the way of speed. It just lumbers around, soaking up damage like a bullet sponge, and throwing pain back at anything that gets in its way. 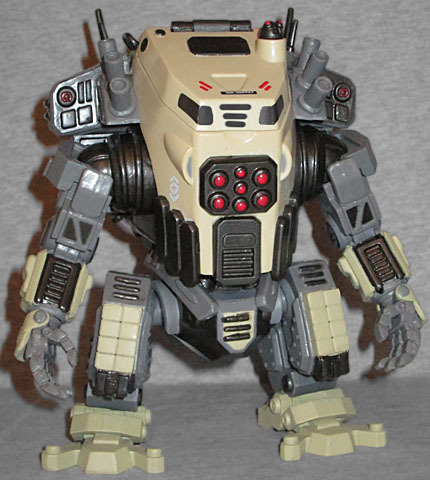 One need only compare Legion to Atlas to see the sense of sturdy power this 'bot suggests. Rather than being round and huggable, the central body is flat and angular. The limbs are the same general thickness, but their shapes follow the same guidelines - squarer here than on the other toy - and Legion's legs have a deeper bend, suggesting that the body they're supporting is weightier. The shoulders are wider, with large elements on them that might be mounted weaponry or perhaps some motivational equipment? Can Titans jump? 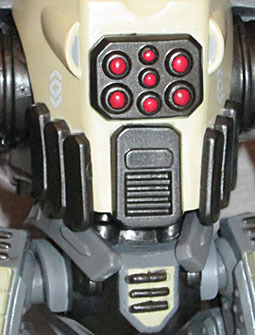 There are things that certainly look like booster jets on his back, and tiny antennae on his shoulders. 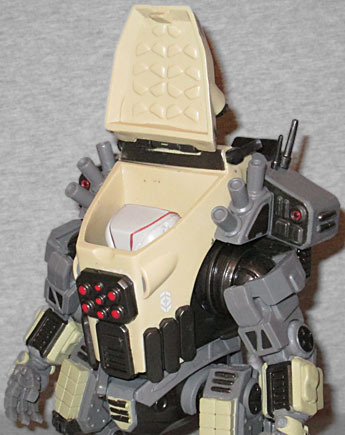 Legion's main color is a dusty yellow, looking like he was designed for desert combat. The limbs are two shades of grey - darker near the interiors than the outsides. There are three horizontal bars on Legion's, er, "area," but the paint on them is misaligned; I bought mine online, but you may want to check that in person before you get one. Two grey stripes near the upper edge of the body could almost pass for small windshields or viewports, except that there's no way an armored behemoth like a Titan would ever have so obvious a weak spot - the pilot views his surroundings via the cameras arranged on the exterior (here painted red). Having two dark spots near the top unerringly makes them look like eyes, however, so it's hard to remember that the red dots on the chest are where it actually "sees." While the normal Funko POP!s are about 4" tall, this is a super-sized POP!, and thus reaches the 6" mark. There is no articulation, even though it would have been exceedingly simple to throw some in - swivels in the shoulders and hips, hinged elbows, stuff like that - possibly because making articulated figures is outside Funko's license parameters. They did, however, leave one hinge in place, to accommodate the most important play feature of all: Legion's hatch opens like a pitcher plant, allowing access to the cockpit. A featureless cockpit would mean nothing without someone to pilot the Titan, so this set includes a minimature 2" POP! pilot. Kuben Blisk is a South African mercenary employed by the IMC's ARES Division. His unit, the Apex Predators, provides "customized security solutions" for the IMC's operations on Typhon. 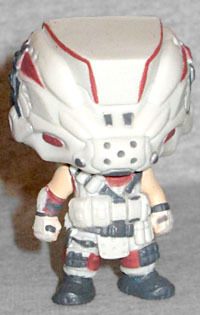 He appeared in the original Titanfall as one of the voices narrating the story that no one paid any attention to, and he's back in Titanfall 2, this time wearing white, red and grey sleeveless armor. Considering the small size of the toy and the simplified nature of POP!s, the sculpt does look quite a lot like the game renders. He's wearing a helmet, rather than being unmasked, which may have been invented just for this toy? He certainly doesn't seem to wear one very often in the actual game. Blisk has the same zero points of articulation as Legion, and while McFarlane Toys has also made a figure of the merc, we feel confident in declaring this one a superior toy. After all, that one may have a few more joints, but it certainly doesn't have a Titan to sit inside, like this one does. And that makes Funko the winner.